Alright, so it doesn’t pertain in any way to either the Ravens or the Orioles, which is what this site is “supposed” to be all about – but there is no way we can not mention that, our alma mater, the UMBC (University of Maryland – B’More County) Retrievers Men’s Basketball team won the America East Conference Championship over the weekend, and are now headed to the NCAA Tournament. The atmosphere at the RAC arena was truly electric, and the Nest wants to send out congratulations to Coach Randy Monroe, Jay Greene, Darryl Proctor, Ray Barbosa, Matt Spadafora, and the rest of the guys on that team. Seeing UMBC on our brackets for the first time this March is something we will always remember. 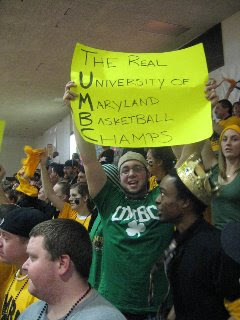 Nick-A-What Showin’ off his sign-makin skills: We know we have some readers who are Terps’ fans – don’t worry we still love them (and you guys) too. Just let us enjoy this one for now. It’s been a long time comin’. This entry was posted on March 17, 2008 at 6:36 pm and is filed under News, Random. You can follow any responses to this entry through the RSS 2.0 feed. You can leave a response, or trackback from your own site.